Do you have an end of the year ritual to close out the ending year and bring in the new year with focus and intention? I have done a ritual off and on over the years, revising it a little each year. I’d like to tell you about it and how I am doing it this year. By now you have probably heard of the Burning Bowl Ritual. If not, a quick search of the internet will produce for you a variety of ways to perform this ritual. Many focus on the negative – removing the old, bad, unused, energy from your exiting year or time period. But a few focus on the positive. This is the direction I take when experiencing this ritual. Even if I am releasing something that no longer serves me, I don’t like to focus on the negative energy of the thought, belief, or missed opportunity. For example, the year I got a divorce, some guides would have had me write some version of words that would focus on the marriage that did not survive, recovery, releasing thoughts of ill will toward my ex-husband. I would choose instead to use positive words, thoughts, images, and intentions. Wish him well in his life, me well in mine. Set the intention that we could successfully co-parent our young child together. Use words such as collaborative, nurturing, supportive. As well as put the intention out there that his new relationship would be successful, that I would find peace, that I could create an atmosphere in which I could thrive. Do you see the pattern? Not, not, not, not… the focus is on the negative. You may be saying these with the intention of release, but what you focus on expands. I will step forward into my new life with excitement. I will greet new relationships with openness and joy. I will create an atmosphere in our home of respect and joy. I will thrive and encourage my son to thrive. I will hear my ex’s words with an open mind and heart. You can release the harms and fouls of the past without focusing on the negative of them. You can let go of the thoughts, attitudes, beliefs that are no longer serving you by using a positive forward thinking approach. I encourage you to look for situations in this past year that you have been considering as failures, issues, challenges, missteps. Reframe them to focus on what the positive is that can come from them. You can also use this ritual to express gratitude and other positive emotions. For example, if you experienced something that brought you great joy or satisfaction, you can also write that gratitude and release it into the universe. Again, what we focus on, expands. To get love, give love. I will move confidently in the direction of my dreams unencumbered by fear of change. I will meet my business obstacles with open arms and welcome the lessons they bring me. I will seek out mentors and guides to educate me how to observe the lessons being presented. I will manifest the skills I need to have the success I desire. I will create an environment that allows me to be financially secure. I am grateful for the opportunities presented this fall that have allowed and encouraged me to grow and pursue my dreams. I send blessings of love, prosperity, and abundance to all my family and friends. New, old, and those I haven’t met yet. Add in any other areas that you need. This ritual is highly personal, set the intentions that will mean the most to you, that will best serve you. You can get really fancy and use special bowls created for this purpose. In the past, I have used a terra-cotta pot because I know I can put the burning papers in them without harming the pot. During the course of 2015, I intend to create a special bowl that I will use only for burnings. Whatever tools you use, I recommend meditating for a few minutes before and after. Clearing your mind so that your true intentions can make their way to the surface. I also prefer to do this ritual free of alcohol and junk food. I eat nourishing foods and have my journal on hand to capture any thoughts, feelings, and emotions that arise during the ceremony. There are also a lot of energy cleanses that those involved in Reiki would recommend. I would encourage you to seek out those educated in such knowledge. My process will vary a little this year. I will not be burning on New Years Eve. I will instead be burning on January 4th. I have many transitions and new journeys beginning on January 5th and I want to step into them with clear mind, body, spirit, and intention. I have also been capturing notes to burn throughout 2014. I have kept them in a wicker box with grounding crystals. I have a smudge stick set aside just for this purpose and will be picking up a blessed candle today. 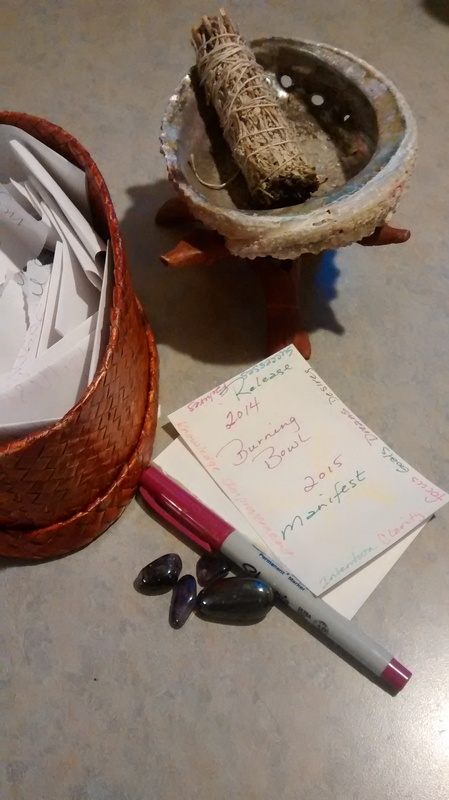 I plan to do this ritual monthly going forward in the new year and beyond rather than once annually. You are welcome to join me. If you would like more details about my process or would like to ‘join’ me in this or subsequent burnings, send me a note using the contact form below. Do you have plans for a burning bowl ceremony? I would love to hear how you do your ritual. Please feel free to share in the comments below.